And so to Jamaica. I feel I must qualify my comments in the knowledge that out there are Jamaicaphiles and Jamaicaphobes so I will try to just keep to the facts and maybe not offer too many opinions. The usual excitement on arriving somewhere new was tempered by the two customs officials and the undercover policeman who took it upon themselves to completely unpack my bags and question me belligerently as to why I was visiting. I thought that odd given the Island’s reputation. Unnerved I proceeded and was met by the driver from my Airbnb, nice guy who guided me through the usual rigmarole of changing money and finding a SIM for my phone then we were off into Kingston. After working for a Jamaican company a long time ago I naively thought the streets would be bouncing with the reggae music, but no, just another big city with horrendous traffic. I did spot some large 4by4 type vehicles decked out with lights and booming speakers. I gesticulated to the driver as if to enquire: hearse, he said. Ok then. Weaving through the traffic we came upon a huge 4-lane highway running north across the island with no other cars on it. In between songs played on the massive sound system in the car I asked what led to the creation of this motorway/freeway. The Chinese made a deal with the authorities to set up an entrepôt just off the harbor in Kingston and in return they built this giant toll road. Note the word “toll”, you must pay to drive on it and of course the local people can’t afford it and continue to use the old road which takes three hours for the North to South coast run, we did it in forty minutes. Then we were there, Bromley House, outside Ocho Rios. Built on the site of an old Spanish fort dating back to the Sixteenth Century the house was a cattle ranch from the Eighteenth Century onwards, in fact it still is. In the late Nineteenth Century it was bought by a Scottish doctor who built it out in the shape it is today with sundry porticoes and balconies. I was billeted in one of the cottages on the grounds with three rooms, a kitchen, bathroom and wrap around verandah. Breakfast was cooked every morning by the lovely Valerie, who also takes care of the paperwork and finances, and consisted of eggs, bacon and an array of local fruits, star apples, mangoes, pineapple and was consistently delicious. Most days my host, Johnathan (Jonna), would drive us down Fern Gulley to Ocho for basic supplies, and rum. He was a rally driver, amongst other things, so the drive down and back up was quite the experience. Of course being born there he knew every twist and turn, he could probably drive it in his sleep, but for me, the newcomer, it was often a white-knuckle ride. There were two guard dogs, Elsa and Meatball, who sort of adopted me and would curl up outside my door and bark furiously if anyone dared come up the driveway. We went to a local beach for lunch and a swim on occasion and despite the mass tourism and cruise ships there was rarely anyone else on it (Sugar Pot). Other times we would go down to the village, Walkerswood, where there is a restaurant called Lyming where we would buy small flasks of the local rum and enjoy fabulous Jamaican food, jerk chicken, jerk pork with Festival, a type of local bread. I failed to sample Mannish Water, a local delicacy, which is a glorified Goat’s Head soup; I’m not going into details, too many vegetarians in my family! Another day we went to a Polo match, Jamaica vs Barbados, tea and triangular sandwiches with lots of gin afterwards. The weeks flew by and I thought I should see some other parts of the Island. Up and up into the legendary Blue Mountains where I stayed at the Mount Edge (hotel, sort of). It seemed to take an age to climb up into the mountains but on arriving the views were stupendous. I visited the Bob Marley museum and felt a bit aged! Not much point in telling anyone of my nights touring with Marley as the label PR guy. A couple of nights in Kingston at the Liguanea club (pronounced Ligeny) which was just about the only accommodation available due to some International conference in town. Interestingly the Liguanea was ‘featured in a James Bond film’, you might like to remember that as I will say it again, soon. Breakfast table and the incredible view. Elsa and Meatball on my verandah. I had a neighbor. A bird, who lived in an adjacent tree. The view from Mount Edge. The Blue Mountains of Jamaica. This entry was posted in Uncategorized and tagged Blue Mountains, Bromley House, Fern Gulley, Jamaica, Mount Edge, Ocho Rios. Bookmark the permalink. 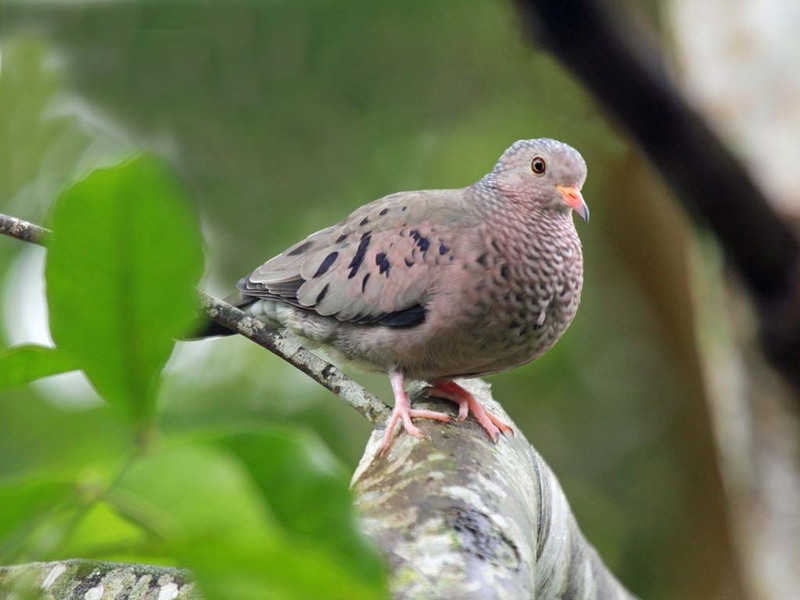 Looking on the trusted Google page, I think it’s the Common Ground Dove. …but I could be wrong…. Tim. thank you for sharing your colorful experience! I especially liked the picture book story of you neighbor, the Bird ! Look forward to the next episode in the next country! Thanks Anna. The Jamaica experience was a while ago but I’m determined to catch up. You, of all people, will be interested in an article I came across about the Kuna, or Guna, people of the islands off Panama (see earlier post).